The thrill of Club racing on the world’s fastest superbikes. Whether you’re a seasoned DRIVECLUB pro or a newcomer to racing for a Club, get ready for the burning tyres, break-neck speed and raw power of the world’s most incredible superbikes. 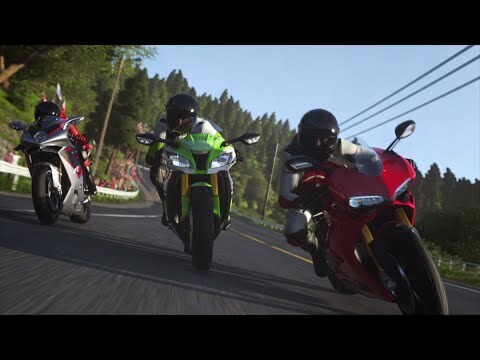 Available as a standalone game or as an expansion if you’re already a DRIVECLUB player, DRIVECLUB BIKES brings you a whole new way to race. Hit the tracks on incredibly fast and agile Superbikes from Ducati, Kawasaki, Yamaha, Honda and more across all 78 DRIVECLUB locations – each offering new challenges for the untamed power of these amazing machines. Remember - if you already own DRIVECLUB on Blu-ray Disc or as a digital download, you'll only need to buy the DRIVECLUB BIKES expansion. Whether you join a Club, set up one of your own or simply stay true to the Club you’re already driving with, it’s all about winning all-important Fame for you and your teammates. The more Fame your Club has, the more events, challenges, rewards and vehicles you’ll get access to – so be sure to find a Club and team up with fellow petrol heads. Take your Superbike-packed garage on a world tour to all the incredibly detailed locations featured in DRIVECLUB – and take them on with all the speed, aggression and white-knuckle thrill of DRIVECLUB BIKES. Ride for the fastest times, highest speeds, perfect laps, best wheelies and other objectives in 78 global locations in Tour mode – you’ll need to bring your A-game to compete for each of the regional trophies. Represent your Club online in multiplayer events and earn Fame against friends from around the world – or create your own event and control everything from the race rules to the weather conditions. Create your own single events and challenges to earn Fame in any type of race, time trial, sprint or skill event – on any track, in any country and with near limitless control over the race-day conditions. Show your skills by nailing Face-Off challenges scattered along each track that have been left by other riders. Beat them to bag the Fame on offer – and leave your mark for the next challenger. Enter a Skill event and pop wheelies, hit fearless stoppies and make every second count in the speed trap zones. Want even more raw power in your garage? Check out the latest DRIVECLUB Bikes add-on packs, including new bikes, new Tour events to race in, additional tracks and shiny new liveries to personalise your fleet of superbikes. Packed with insider tips direct from Evolution Studios, tons of very useful info and links to all the latest DLC updates from PlayStation®Store, the official gamer guide is the perfect handbook for superbike racing fans.